Founder Paul Coughlin speaks to elementary school children in Magu, which enjoys a peaceful relationship between children of different religions. The Protectors and Africompassion joined forces in 2014 to combat bullying throughout Tanzania and Uganda. Multiple schools and related organizations have implemented our freedom-from-bullying program, and it is our hope to bring freedom from bullying to even more groups throughout that region. 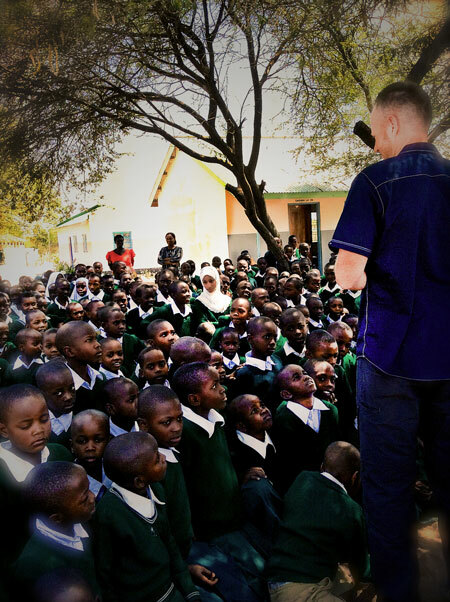 Our Protectors Nation East Africa 2014 Summer Tour was an incredible success. We spoke to and worked with thousands of students, faculty and teachers within both private and public schools to fight this growing problem throughout the world that decreases learning, increases school violence and harms many well into adulthood. As a result of our partnership with Africompassion, we have identified four pilot programs throughout Tanzania and Uganda. The Protectors has also been asked to return and conduct a four nation-wide conference that will provide specific anti-bullying training to leaders in each community. Each pilot program costs just $350, which will allow us to provide needed materials at cost to each organization. We can’t forget meeting the 12-year-old girl from Magu. She was born with a birth defect leaving one leg longer than the other, causing her to walk with an extensive limp. Together we can change her story and the thousands just like her in this part of the world. Together we can nurture and train protectors in her school to defend her and others from what is now the leading form of child abuse. We are currently seeking donors to help us expand our efforts in this region. For more information please contact us.